ColorNote Notepad is one of the many Android applications allowing you to take notes on your device. The application will fill your smartphone with colorful post-its with which you will not forget to do important things. The application takes up very little space ( less than 1MB ) , and has a considerable amount of features that allow it to stand out from others in its class. ColorNote Notepad allows you to take notes in different colors so that you can differentiate a glance . Similarly, you can password protect any note you choose to keep private . Another interesting feature of the program is one that allows you to synchronize your notes between your different devices, for example you can have the same files on both your smartphone and tablet. You can easily do this using the gadgets of the device. 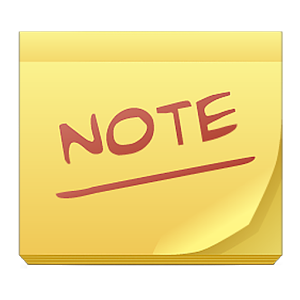 Finally, ColorNote Notepad allows you to combine audio and visual alerts with your notes, you can for example trigger an alert for a particular time or day. ColorNote Notepad is a tool for taking notes in both simple and comprehensive, easy to use and lightweight, its features are many and it can be really helpful .